Aim: To evaluate and compare composite bond strength to carbamide peroxide bleached enamel following the application of 10% and 25% sodium ascorbate and alpha-tocopherol solutions. Materials and Methods: Sixty premolars were divided into six groups. Groups I and VI served as unbleached and bleached controls respectively. 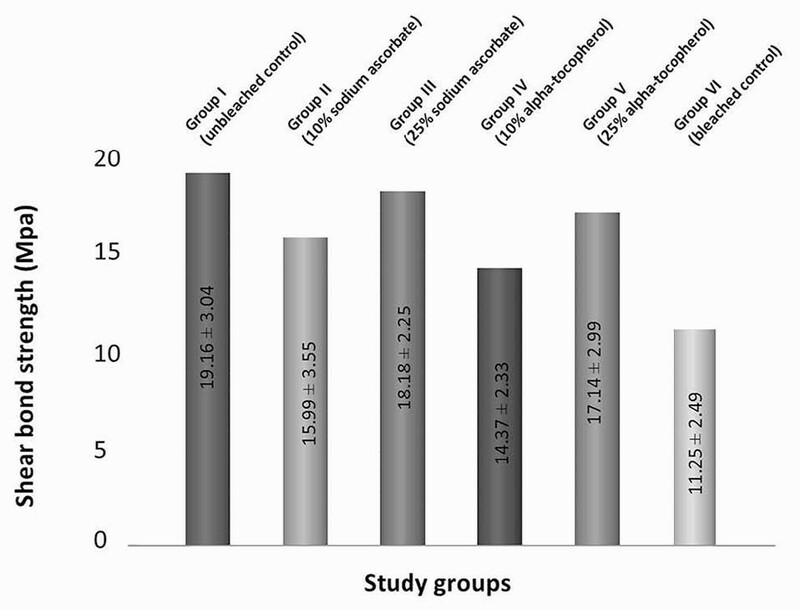 Groups II, III, IV and V served as the experimental groups and were subjected to 10% carbamide peroxide bleaching followed by 10 min application of 10% and 25% sodium ascorbate and 10% and 25% alpha-tocopherol solutions, respectively. Following composite bonding, shear bond strength was determined and the results were analyzed using ANOVA and Tukey highest significant difference test. Results: Only Group IV showed significantly lower bond strength when compared to Group I (unbleached control). When compared to Group VI (bleached control), except Group IV, groups II, III and V showed significantly higher bond strength. However, there was no statistically significant difference between the experimental groups corresponding to 10% and 25% and similar concentrations of sodium ascorbate and alpha-tocopherol solutions. Conclusion: Following 10% carbamide peroxide bleaching, except 10% alpha tocopherol, 10 min application of 10% and 25% sodium ascorbate and 25% alpha-tocopherol solutions significantly improves the shear bond strength of composite resin to enamel. In this regard, a shorter clinical application time for these agents is an additional desirable feature. Ten percent sodium ascorbate, with an application time ranging from 10 min to 3 h, is commonly recommended to improve composite bond strength following bleaching. Ten percent sodium ascorbate in solution form is suggested for shorter application time. ,,,,, In the context of shorter application time, the use of higher concentration of sodium ascorbate solution has also been recommended. However, the effect of this on the composite bond strength has not been widely evaluated. Alpha-tocopherol, a powerful antioxidant in the lipid phase of the human body, has been recently suggested for improving composite bonding following bleaching. In a context similar to sodium ascorbate, solution form of alpha-tocopherol may be preferred for shorter application time. The beneficial effect of alpha-tocopherol solution is attributed, in addition to its antioxidant effect, to its alcoholic solvent. However, studies are lacking on the effect of varying concentration and shorter application time of alpha-tocopherol solution on composite resin bond strength. Since sodium ascorbate and alpha-tocopherol solutions have similar mode of action, studies comparing them would be clinically relevant. According to a previous study, 10% alpha-tocopherol solution when used for 2 h was found to be more effective than 10% sodium ascorbate. However, further studies in the above context are of clinical importance. Therefore, the present study was carried out to evaluate and compare the shear bond strength of composite resin to 10% carbamide peroxide bleached enamel following the 10 min application of 10% and 25% sodium ascorbate and alpha-tocopherol solutions. 0.02 ml of 10% carbamide peroxide bleaching gel (Opalescence PF, Ultradent Products, Inc., South Jordan, UT, USA) was placed on the buccal surface of the samples using a calibrated syringe. The samples were kept partially immersed in a container containing distilled water at 37°C for 8 h a day. They were immersed in such a way that the enamel surface coated with the bleaching gel did not come in contact with the distilled water. The above procedure was repeated on a daily basis for one week. 10 g and 25 g of sodium ascorbate powder (Sodium L (+) Ascorbate, LOBA CHEMIE Pvt. Ltd., Mumbai, India) were mixed separately in 100 ml of distilled water in a standard flask to prepare 10% and 25% sodium ascorbate solutions, respectively. Similarly, 10 g and 25 g of the alpha-tocopherol gel (DI-a-Tocopherol acetate, LOBA CHEMIE, Mumbai, India) were mixed in 100ml of ethyl alcohol to prepare 10% and 25% alpha-tocopherol solutions, respectively. Following 10% carbamide peroxide bleaching, 10 ml of the 10% and 25% of sodium ascorbate solutions was applied on the buccal surface of groups II and III, respectively. Similarly, 10 ml of the 10% and 25% of alpha-tocopherol solutions was placed on the buccal surface of groups IV and V, respectively. The solutions were applied using a calibrated syringe with a flow rate of 1 ml/min. The applied solutions were continuously agitated using a sterile brush. After 10 min, the solutions were rinsed off the tooth surface for 30 seconds using distilled water and ethanol for sodium ascorbate and alpha-tocopherol solutions respectively and samples were air dried. The samples were etched using 37% phosphoric acid gel (Scotchbond TM Multi-Purpose Etchant, 3M ESPE, St. Paul, MN, USA) followed by bonding agent (Adper TM Single Bond 2 Adhesive, 3M ESPE, St. Paul, MN 55144, USA) application as per manufacturer's instructions. Customized split metal casing was assembled around the samples to form a circular hole of dimensions 3 mm × 4 mm followed by placement of the resin composite (Z100 TM Restorative, 3M ESPE, St. Paul, MN, USA) increments in the hole and curing as per manufacturer's directions. The metal casing was removed to obtain the samples with cylindrical extension of composite resin bonded to bleached enamel. The samples were subjected to shear bond shear bond strength evaluation using Universal Testing Machine (Instron, model 3366, Instron Corp, Canton, MA, USA). A knife edge shearing rod and a crosshead speed of 0.5 mm per min were used. The load at failure was recorded by the software. The shear bond strength of the samples was calculated and expressed in megapascals (MPa). The results were analyzed by using ANOVA (one-way analysis of variance) and Tukey highest significant difference (HSD) test. The mean composite shear bond strength of the study groups tested is shown in [Figure 1]. One-way analysis of variance (ANOVA) showed statistically significant difference among the study groups (P < 0.00l). As shown in [Table 2], according to Tukey HSD test, only Group IV (10% alpha-tocopherol solution) (P < 0.05) showed significantly lower composite shear bond strength among the experimental groups when compared to Group I (unbleached control). As depicted in [Table 3], except Group IV (10% alpha-tocopherol solution), Groups II (10% sodium ascorbate solution), III (25% sodium ascorbate solution) and V (25% alpha-tocopherol solution) (P < 0.05) showed significantly higher composite shear bond strength when compared to Group VI (bleached control). However, as shown in [Table 4], comparison between 10% and 25% concentrations and between similar concentrations of sodium ascorbate and alpha-tocopherol solutions showed no statistically significant difference in the shear bond strength between the corresponding groups among the experimental Groups I, II, III and IV. In the present study, solution forms of 10% and 25% sodium ascorbate and alpha-tocopherol were evaluated. The solution form has got faster onset of action and is recommended for shorter clinical time of application. Ten percent solution was employed in the study as it is suggested to be the minimum effective concentration and is most commonly employed in various studies, whereas 25% solution served to study the effect of higher concentration of sodium ascorbate and alpha-tocopherol on composite bond strength. In the present study, results showed that except 10% alpha-tocopherol solution, 10 min application of 10% and 25% sodium ascorbate solutions and 25% alpha-tocopherol solution achieved significantly higher bond strength than the bleached control suggesting improved bonding following 10% carbamide peroxide bleaching. Nevertheless, the achieved bond strength was lower than the unbleached control. However, it was significantly lower only with respect to 10% alpha-tocopherol solution further denoting that the application of 10% and 25% sodium ascorbate solutions and 25% alpha-tocopherol solution improved bond strength closer to that of unbleached enamel. The effectiveness of sodium ascorbate applied for a shorter time up to 10 min is in agreement with a study by Türkün et al. However, there was no statistically significant difference in the bond strength between 10% and 25% sodium ascorbate solutions in the present study. This is in accordance with a study by Dabas et al. where they showed no difference in bond strength with an increase in the concentration of sodium ascorbate. On the other hand, with respect to alpha-tocopherol, 10 min application of only 25% alpha-tocopherol solution showed significantly higher bond strength to bleached enamel but not 10% alpha-tocopherol solution. Nevertheless, there was no statistically significant difference between them. In relation to 10% alpha-tocopherol solution, the finding in the present study is in contrast to a previous study. In a previous study, 10% alpha-tocopherol solution was found to be most effective. This may be attributed to duration of application as 10% alpha-tocopherol solution was used for 2 h in the previous study, whereas in the present study it was used only for 10 min. Therefore, from the present study it can be inferred that for a shorter clinical application time up to 10 min, 10% alpha-tocopherol solution would be ineffective than either its higher or similar concentration sodium ascorbate solution in significantly improving composite bonding to carbamide peroxide bleached enamel. Since comparing the bond strength between similar concentrations of sodium ascorbate and alpha-tocopherol solutions showed no statistically significant difference, from the present study it can be concluded that except 10% alpha-tocopherol solution, 10 min application of 10% and 25% sodium ascorbate solutions and 25% alpha-tocopherol solution significantly improves shear bond strength of composite resin to 10% carbamide peroxide bleached enamel. However, similar studies are required to evaluate the enamel and dentin bleached with different concentrations of carbamide peroxide and role of further higher concentration of sodium ascorbate and alpha-tocopherol solutions on bond strength to them and their clinical significance. Following 10% carbamide peroxide bleaching, except 10% alpha-tocopherol solution, 10 min application of both 10% and 25% sodium ascorbate solutions and 25% alpha-tocopherol solution may be suggested to significantly improve shear bond strength of composite resin to enamel. 1. Haywood VB. Frequently asked questions about bleaching. Compend Contin Educ Dent 2003;24:324-38. 2. Swift EJ Jr. Restorative consideration with vital tooth bleaching. J Am Dent Assoc 1997;128:60S-4S. 3. Stokes AN, Hood JA, Dhariwal D, Patel K. Effect of peroxide bleaches on resin-enamel bonds. Quintessence Int 1992;23:769-71. 4. Garcý×a-Godoy F, Dodge WW, Donohue M, O'Quinn JA. 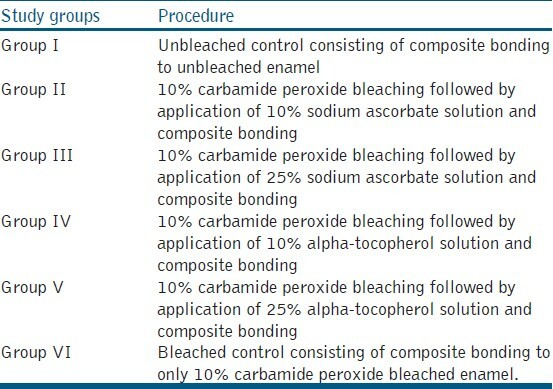 Composite resin bond strength after enamel bleaching. Oper Dent 1993;18:144-7. 5. Nour El-din AK, Miller BH, Griggs JA, Wakefield C. Immediate bonding to bleached enamel. Oper Dent 2006;31:106-14. 6. Breschi L, Cadenaro M, Antoniolli F, Visintini E, Toledano M, Di Lenarda R. Extent of polymerization of dental bonding systems on bleached enamel. Am J Dent 2007;20:275-80. 7. Hegedüs C, Bistey T, Flóra-Nagy E, Keszthelyi G, Jenei A. An atomic force microscopy study on the effect of bleaching agents on enamel surface. J Dent 1999;27:509-15. 8. Unlu N, Cobankara FK, Ozer F. Effect of elapsed time following bleaching on the shear bond strength of composite resin to enamel. J Biomed Mater Res B Appl Biomater 2008;84:363-8. 9. Cavalli V, Reis AF, Giannini M, Ambrosano GM. The effect of elapsed time following bleaching on enamel bond strength of resin composite. Oper Dent 2001;26:597-602. 10. Lai SC, Tay FR, Cheung GS, Mak YF, Carvalho RM, Wei SH, et al. Reversal of compromised bonding in bleached enamel. J Dent Res 2002;81:477-81. 11. Kunt GE, Yýlmaz N, Sen S, Dede DÖ. Effect of antioxidant treatment on the shear bond strength of composite resin to bleached enamel. Acta Odontol Scand 2011;69:287-91. 12. Sasaki RT, Flório FM, Basting RT. Effect of 10% sodium ascorbate and 10% alpha-tocopherol in different formulations on the shear bond strength of enamel and dentin submitted to a home-use bleaching treatment. Oper Dent 2009;34:746-52. 13. Silva JM, Botta AC, Barcellos DC, Pagani C, Torres CR. Effect of antioxidant agents on bond strength of composite to bleached enamel with 38% hydrogen peroxide. Mat Res 2011;14:235-8. 14. Türkün M, Kaya AD. Effect of 10% sodium ascorbate on the shear bond strength of composite resin to bleached bovine enamel. J Oral Rehabil 2004;31:1184-91. 15. Kaya AD, Türkün M, Arici M. Reversal of compromised bonding in bleached enamel using antioxidant gel. Oper Dent 2008;33:441-7. 16. Türkün M, Celik EU, Kaya AD, Arici M. Can the hydrogel form of sodium ascorbate be used to reverse compromised bond strength after bleaching? J Adhes Dent 2009;11:35-40. 17. Freire A, Durski MT, Ingberman M, Nakao LS, Souza EM, Vieira S. Assessing the use of 35 percent sodium ascorbate for removal of residual hydrogen peroxide after in-office tooth bleaching. J Am Dent Asso 2011;142:836-41. 18. Kimyai S, Valizadeh H. The effect of hydrogel and solution of sodium ascorbate on bond strength in bleached enamel. Oper Dent 2006;31:496-9. 19. Garcia EJ, Oldoni TL, Alencar SM, Reis A, Loguercio AD, Grande RH. Antioxidant activity by DPPH assay of potential solutions to be applied on bleached teeth. Braz Dent J 2012;23:22-7. 20. Gökçe B, Cömlekoðlu ME, Ozpinar B, Türkün M, Kaya AD. Effect of antioxidant treatment on bond strength of a luting resin to bleached enamel. J Dent 2008;36:780-5. 21. Dabas D, Patil AC, Uppin VM. Evaluation of the effect of concentration and duration of application of sodium ascorbate hydrogel on the bond strength of composite resin to bleached enamel. J Conserv Dent 2011;14:356-60.